Every woman should have a classic leather jacket in her closet. If you don’t yet own one, you are missing out! This staple piece is considered a wardrobe essential because it’s so versatile. It not only goes with almost everything but also adds an instant edge to any outfit. We love this mix of ultra-feminine and edginess – this outfit proved that you can look elegant in leather. Keep your styling simple, adding a gold metal belt, some delicate gold jewelry and a pretty clutch bag for a bit of extra edgy glamour. Leather skirt and jacket are from Zara. Although they started off as a classic work shoes, these boots gained the status of fashion staple. They are comfy, waterproof and easy to style. This blogger keeps it casual by rocking her leather jacket with basics available in any wardrobe – leather pants, leopard top and cool black beanie. This outfit looks infinitely comfortable and stylish! This outfit is perfect for a business meeting – it’s elegant and very trendy. Every woman can pull it out since you only need white blouse, leather skirt, sweatshirt, leather jacket, black stockings and black heels. It’s that simple! Add geometric or tribal statement necklace to freshen up the whole look. If you’re having a bad hair day you can easily hide it under your stylish beanie. Big scarf can take almost any outfit up a notch, especially if you style it with your leather jacket. Beanie and scarf are must have accessories for colder months. Not only they are really fashionable pieces but they also keep you warm and comfortable. Midi skirt is a perfect piece for this season festive events. If you don’t want to be too elegant, you can style this amazing piece with your favorite leather jacket. As you can see, adding a leather jacket to your outfit is never a bad idea (even for formal events). This complete outfit will make you stand out. 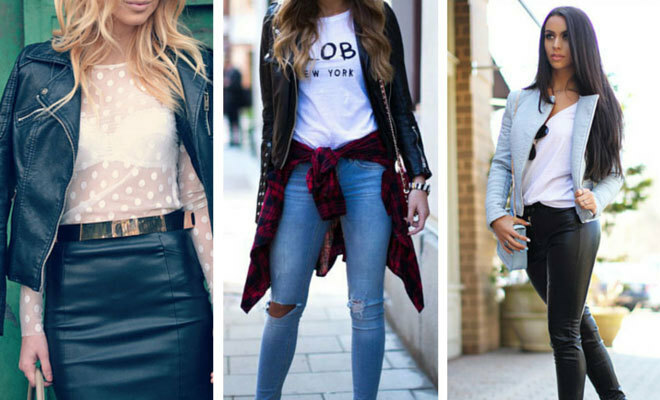 A great way to style your leather jacket is to wear it with boyfriend jeans. This pretty fashion blogger illustrates a super cool outfit that can be achieved with some simple pieces from your closet. If you still don’t have boyfriend jeans, it’s time to steal one from his closet and pair them with your girly heels! Would he mind? This baby blue leather jacket is a perfect way to break up the monotonous look and to add a subtle colour. It’s so cute but edgy at the same time. Baby blue is a very versatile colour and can work with most things. Carli decided to style her with black leather pants and white T-shirt. Enhance the outfit with pastel blue nails, bag in the same color and gold rings. Big, comfy sweater is the most representative fashion piece for colder weather. Leather jacket and sweater are ideal combination for daily walks or lunch and shopping with your friends. Since this is a casual outfit without too much jewelry and accessories, the right headpiece can give your outfit a push. Plaid shirt and leather jacket make the perfect casual outfit. It’s so comfortable and looks great on everyone. Leather jacket, white T-shirt, jeans and plaid shirt are perfect combo for lazy Sunday outfit. Maxi skirt can also be worn during the fall and winter. Now that the temperature has dropped, the coolest way to wear your maxi skirt is with the leather jacket. Picture above explains it all.